Harry S. Truman, 32nd President of the United States, is said to have spent much of his ~6-year tenure in the White House in a futile search for a two-handed economist. Presumably, he never found one, but hey, he was busy. When he was forced had to take over, with little preparation and somewhat unexpectedly, for a guy who still holds the record for tenure in the office, he’d been Vice President for all of three months. The transition transpired just as our boys and our allies were mopping up matters in Berlin, and beginning the process of splitting up Germany between the Yanks and the Russians. He then turned his attention to the Japanese, still menacing our troops in the Pacific, but made short work of them, as everyone knows, by dropping “Little Boy” on Hiroshima and “Fat Man” on Nagasaki. Shortly thereafter, he set up NATO and established the Marshall Plan to rebuild Europe. On May 14, 1948, 11 minutes after Israel declared itself a sovereign nation, Truman officially recognized its status and independence. This of course, was an election year, and though he was widely expected to go down, he pulled off the most surprising victory this side of, well, this side of that interesting contest in 2016. Less than two years later, he’d entered us into the Korean War, a conflict that: a) has not to this day officially ended; and b) bears consequences with which we are still contending – nearly 70 years later. So let’s just agree that Harry was not in a position to focus his full attentions on his ultimately futile search for a bi-manus practitioner of The Dismal Science. But I’m not sure that even absent myriad distractions, he would’ve ever found what he was looking for. Because, in economics, there is always a second hand. Those of us who have studied the discipline will tell you that this is because the whole thing is based upon tradeoffs. An economic agent must choose, in almost all instances, between two sub-optimal set of outcomes. You can have one from Column A or one from Column B, but not both. It’s either paper or plastic. Chicken or egg. You can’t eat your cake and still have it (unless of course you are the lady Bob Dylan is trying to lay in “Lay Lady Lay”). One cannot wash one hand without the other, and as for washing the face without both? Fuggedaboudit. Examples of these trade-offs also abound across the current human comedy. There, is, on the one hand, fire on the West Coast, and, on the other, ice on the East (the latter condition to which I bore personal witness when a one-hour commute home on Thursday stretched to seven). These disparate conditions on each coast would suggest to any economist worth his or her salt that on average, conditions are pretty comfortable. However, unless you have the bad taste to live in flyover country, you must pick one or the other (though neither of them are to be what they claim). Such dichotomies are the conceit of the econ game, but it all got me to thinking that while a one-handed economist might be harder to find than a penguin in a clover field, and while they grind out two-handed economists out of the world’s leading universities like link sausages, a three-handed economist, readily available, might come in pretty handy in these troubled times. So that’s what I’m going to designate myself. (With a nod to Gilbert and Sullivan) a three-handed economist I, a thing of dubious forecasts, thinking the future will look like the past... And no one can stop me, because in a world where self- definition of gender, race and even age identity (y’all probably saw the news item of the 69 year old Dutch guy who has petitioned for the legal right to identify as being 49) has become an inalienable right, I hereby proclaim myself to be a tri-manu evaluator of all matters of supply and demand. But know, my loves, that all of this changes nothing. I’m going to keep doing what I’ve always done, which includes laying my unique form of madness on anyone who cares to observe it, each week. And this time ‘round, there’s no shortage of madness to share. I’d say that on the whole, and after as difficult a month and a half as my dimming memory can recall, the markets and their participants have earned themselves a holiday. It was, of course, another tough week in equity-land, which ended with a modest two-day recovery that offered little respite in terms of portfolio performance. On the other hand, we did manage to turn the calendar from the 45-day hedge fund redemption window, in the process removing one glaring uncertainty from a roster of issues that have plagued investors pretty much all year. However, on the third hand, the early returns of the cycle suggest that it is going to be a pretty lean Christmas in Hedge Fund Village, and that many funds might not make past New Year’s Day. We’re now 92% of the way through Q3 earnings and overall, they show the strongest quarterly performance since 2011. On the other hand, the return-essential tech sector laid a big fat egg, with less- followed but vital chip makers NVIDIA and Applied Materials both missing and missing badly on Thursday. Finally, On the third hand, it may very well be that the worst of the tech news is already built into valuations, and that any incremental strength in the holiday cycle and capital spending paradigm would catalyze some justifiable upside in the coming months. On the third hand, I strongly suspect that while household debt – when taken to excess – is most certainly a problem, it is corporate debt issues that are most likely to vex investors -- first and most deeply. 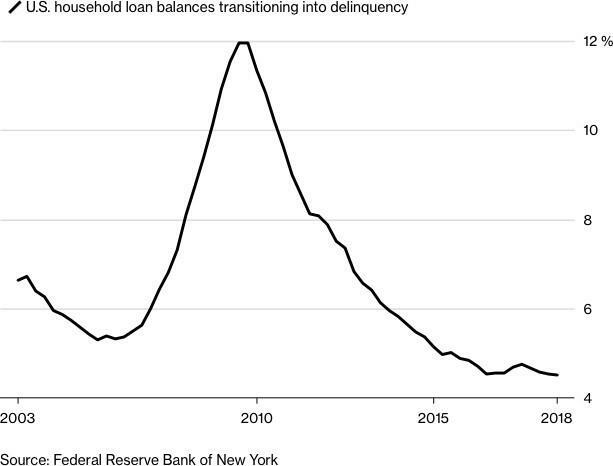 The attention-grabbing news in credit markets this week is the spiraling decline in the price of obligations for the once-iconic General Electric Corporation, which owes approximately $120 Billion in total, 1/3rd of which takes the form of revolving credit lines with pretty much the entire bulge bracket. The rating agencies, even as I pen this, are issuing menacing threats to lower GE’s credit rating to junk, and no one should wish this outcome – not even short sellers. 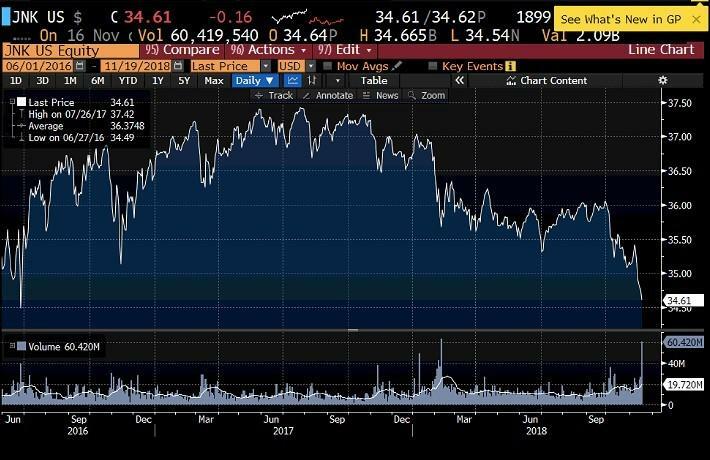 I’m not gonna lie: all of this has me wringing all three of my hands – particularly because when high-yield investors hit the sell-button in contemporaneous fashion, it can be about as ugly as any spectacle you might ever care to witness in the markets. Unless entire economies unravel, buyers do eventually emerge, but only at prices that are unthinkable even under impaired market conditions. I don’t think that politicians can withstand the rout, so I do hold out hope that even if the worst happens, somebody (read: taxpayers) will come in to stem the bleeding. Meantime, with the midterms over, and with some clarity as to who rules the roost in Washington, perhaps we are now in a position to dial down the agita on that score. As indicated last week, the prognosis for a split government is one that is typically constructive for market securities. In fact, dating back to my undergrad days of 1906, the average return over the 3 quarter interval that includes the election itself, combined with the subsequent two, is 14%. Speaking for myself, I’d be pretty happy if the equity markets followed script here, and were trading around, say, 3100 at the end of next June. And I suspect I wouldn’t be alone in these sentiments. However, brothers and sisters, we have a good deal of wood to chop between now and next summer, and just getting through the end of November is likely to be a high-drama exercise. I do suspect that the upcoming week will be a quiet one, with a combination of holiday disengagement and – let’s face it – volatility fatigue -- putting something of a speed bump on the action. But then all eyes turn to the G20 meeting, and, more specifically, to the big November 30th summit between Trump and Xi. By all accounts, both sides appear to have something to gain if the meeting goes well, and a great deal to lose if it doesn’t. I truly think that Trump, more than any time in his, er, glorious tenure as president, can use a win here, and I suspect that he aims to get one. On the other hand, if he doesn’t, and both sides come out of the conference at long daggers, then I would anticipate something of a “risk off” rout in the markets – for year end and perhaps beyond. On the third hand, the latter scenario is so unthinkable that I’m going to assume that interests are sufficiently aligned here to evoke the strong probability that the principals will gather themselves and throw a bone to their good-news-starved constituents. So, in summary, one hand says it’s very risky out there and not a good time to load the boat, while the second hand thinks that some good bargains abound in the investment universe. The third hand doesn’t know what to think about risks in these crazy markets. And this is the worst confession I have to make as a three-handed economist: that I’m just not sure. So, one way or another, I couldn’t have offered much in the way of help to Harry. But Harry was a no nonsense type of cat, and his own common sense would suggest the following: if you’re not sure, then don’t act assertively. So don’t. Act assertively here, that is. Let’s just wait and see what happens. This post is brought to you by General Risk Advisors, a full-service risk solutions group. For more information, visit genriskadvisors.com or contact GRA@genriskadvisors.com.